The head of JP Morgan has delivered a furious tirade against “banker bashing”, complaining that the entire industry is being tarred with the same brush and implying that bankers have become political whipping boys. Jamie Dimon, one of Wall Street’s best known and most respected chief executives, told an audience at the World Economic Forum in Davos that there was a “huge misconception” that all banks ran into trouble during the financial crisis. In fact, he said, JP Morgan and its stronger rivals were “stabilising” influences and he insisted that banks would not “bend down and accept” abuse. Dimon, who was once characterised as Barack Obama’s favourite Wall Street banker but who fell out with the administration over financial reform, made clear his fury at the tone of public, political and media attacks on banks. His remarks chime with other bank bosses who have also been trying to turn the public’s attitude towards the sector, which has been struggling with its reputation since the 2008 financial crisis. Bob Diamond, chief executive of Barclays, told the Treasury select committee of MPs earlier this month that the “period of remorse and apology” for banks needed to end. Prime Minister David Cameron has also warned against “banker bashing” and said that a “lot of people” were to blame for the banking crisis. 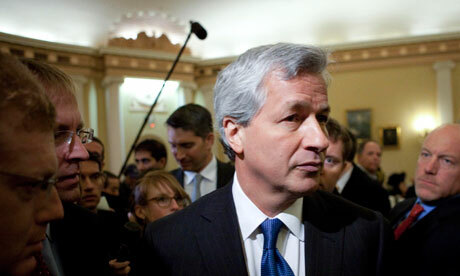 Dimon played down concerns that the bankruptcy of municipalities in the US would trigger fresh systemic shocks. “There are 14,000 municipalities and you are unfortunately going to see some bankruptcies. It will be an issue for some and they have built up these obligations – pensions kind of snuck up on people … you are going to see some municipalities use the bankruptcy courts to try to renegotiate some of those contract”.